Now includes free e-Book when you order directly from ADA Catalog! When you purchase the CDT 2019 and Companion Kit with Code Check App , you’ll have every resource you need to provide the utmost in patient care. 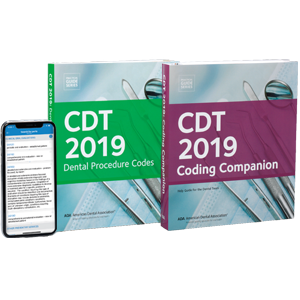 This kit is comprised of every CDT-related product the ADA provides, and they’re all designed to work together to educate your staff on proper dental coding procedures – improving their comprehension and your bottom line at the same time. • Buy the kit and save $30 off the individual product prices! What makes this product different from the CDT 2019 and Companion Kit is the inclusion of the ADA’s unique CDT Code Check mobile app. This handy, searchable app contains the most up-to-date CDT Codes, including new and revised procedure codes. CDT Codes clearly document a service to a patient and consider the latest clinical advances, making for easier coding and faster reimbursement. Save your business time and money by ordering your own CDT 2019 and Companion Kit with Code Check App today! For more information on the 2019 CDT codes, including any errata notices, please visit https://www.ada.org/en/publications/cdt.